A bright white light illuminates the austere marble of a statue of Hercules on display in the new Greek and Roman Galleries at the Metropolitan Museum of Art in New York. High above, an interior skylight mounted within a newly heightened roof allows a flood of fluxing natural light to imbue the space below with a preternaturally peaceful atmosphere. The original McKim Mead and White design for the galleries, dating from 1926, has been completely transformed to provide a majestic setting befitting the world-renowned collection of ancient treas- ures now on display. This splendid atrium, styled after a classical peristyle garden, is named for none other than philanthropist Shelby White and her late husband, Leon Levy. White, who is also a noted writer and art collector, sat down with Art and Living to talk about the court, the art that has finally been unveiled within it, and her unique brand of scholarly philanthropy. Art and Living: What was your first encounter with the art of the classical world? Shelby White: When I was just out of college, I was fortunate to work for a film pro- ducer who made a documentary about Greek art and I fell in love with a special type of Greek vase called a lekythos, which I first saw at the British Museum. A and L: Your husband, Mr. Levy, was also a great connoisseur and collector of the art of the ancient world. How did you two influence each other? SW: My husband was fascinated by ancient history— he was particularly interested in Gibbon’s Decline and Fall of the Roman Empire.This led us to Roman art, especially Roman portraits. a Canaanite site in Israel that we have supported for twenty years. I was recently there and helped excavate the skull of a Canaanite who died almost 3400 years ago.The teeth were still in perfect condition. My dentist would have been impressed! A and L: How has your passion for Greek and Roman art led you to philanthropy? ars of valuable research. So we set up the White-Levy Program for Archaeological Publications at Harvard and have given away more than nine million dollars to archaeologists in Greece, Cyprus, the United States, Italy, Israel, and other countries to ensure the publication of their work. The Leon Levy Foundation also supports research programs for the mind and brain at Rockefeller University. In 2006, the foundation pledged two hundred million dollars to NewYork University to establish the Institute for the Study of the Ancient World, to serve as a center for advanced scholarly research and graduate education and intended to cultivate cross-cultural study of the ancient world from the western Mediterranean to China. This summer, the foundation announced the donation of a chair to the Maxwell School of Syracuse University to be named after the late Senator Daniel Patrick Moynihan who was a great friend of mine and my husband’s. A and L: In providing such enthusiasm and resources to make these galleries come to life, you have been a major force in the “rescue” of thousands of works of art from storage. How do you feel about this? 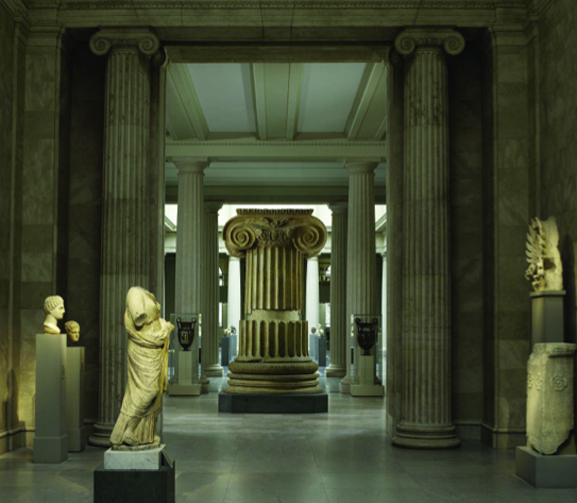 SW: I think the galleries at the Metropolitan Museum are beautiful and a wonderful setting for the Met’s collection. The public now has the opportunity to see many magnificent pieces that had been in storage for years. A and L: Did you have any direct working relation- ship with the architect? SW: While I didn’t work directly with Kevin Roche, I followed the development of the plans and the installation very closely over the many years of the project. A and L: What are some of the works of art in the Greek, Roman and Etruscan galleries that appeal to you the most? SW: While it’s always hard to choose favorites, I am especially fond of the bust of Hadrian from our collection that is onloantothenewgalleries.Itwasfoundinthe18th century at the emperor’s villa. I like to think that he strolled past it when he walked in his garden.Today, millions of visitors can share that same experience. Pictured: View of the Leon Levy and Shelby White Court with marble statue of the youthful Hercules, A.D. 69-98. Roman, Flavian period. Adaptation of a Greek statue type of the 4th century B.C.The Metropolitan Museum of Art, Gift of Mrs. Frederick F.Thompson. Image courtesy The Metropolitan Museum of Art.